Pictured rehearsing for Olentangy Liberty High School’s upcoming production of “State Fair” are senior Conel Orem, left, as Pat Gilbert; and senior Jessica Greenwald, right, as Margy Frake. 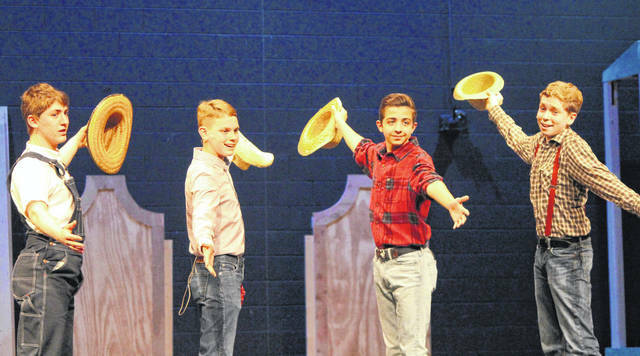 Pictured rehearsing for Olentangy Liberty High School’s upcoming production of “State Fair” are, left to right, senior Aidan Behrens as Abel Frake, freshman Carson Zorn as Hank, freshman Cade Miller as Clay, and freshman Nicholas Sanchez-Zarkos as Lem. 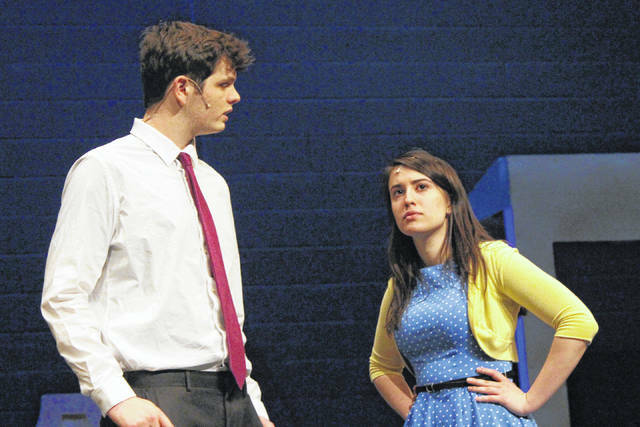 Olentangy Liberty High School is set to debut its spring musical this week as the Liberty Theater Workshop presents Rodgers and Hammerstein’s “State Fair” beginning Thursday. Shows on Thursday, Friday and Saturday will begin 7 p.m., while Sunday’s show will start at 2 p.m.
“State Fair” began as a novel written by Phil Stong in 1932 and was later adapted into an Academy Award-winning movie musical by famed composer Richard Rodgers and lyricist/librettist Oscar Hammerstein II. The musical opened on Broadway in 1996 and was produced by Hammerstein’s son. “Set against the colorful backdrop of an American heartland tradition, ‘State Fair’ travels with the Frake family as they leave behind the routine of the farm for three days of adventure at the annual Iowa State Fair,” Liberty’s press release states. “Mom and Pop (seniors Lydia Namakydoost and Aidan Behrens) have their hearts set on blue ribbons, while their daughter and son (senior Jessica Greenwald and sophomore Harris Hernandez) find romance and heartbreak on the midway. “Set to the magical strains of an Academy Award-winning score (including ‘It Might As Well Be Spring’ and ‘A Grand Night for Singing’) and augmented by other titles from the Rodgers and Hammerstein songbook, ‘State Fair’ is the kind of warm-hearted family entertainment only Rodgers & Hammerstein could deliver,” the release adds. Director Dan Skrovan said this will be the first time Liberty has done a Rodgers and Hammerstein production, and he is excited to get to present a classic. Although it is an extension of the movie musical from 1945, Skrovan noted the story didn’t hit the stage until 1996, meaning there are still some contemporary qualities to the show. Tickets can be purchased online at www.ticketracker.com, using the keyword “Liberty,” or at the school box office between 10 a.m. and 1 p.m. Adult tickets are $15 and children are $5.